my guess is a fairly accurate birth time given the source notes in the above link. could be off 5-10 minutes or so, but i am going to work with it here. i wanted to take up vickis comments on the mundane forum from today on the 'will the uk leave the eu" thread page 11 comments. she mentions directing the lunar return.. "Well I looked again at his lunar return. On the day of the referendum there were directions ( by one degree method) which made favourable aspects to the Opening Poll chart. 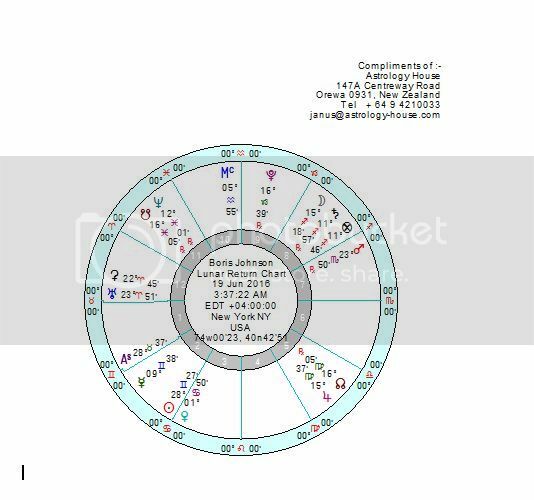 here is the present lunar return for boris - june 15 2016. i am confused if this is the chart you are working with.. let me know if not.. this is not a relocated chart and is based off the above chart for him set to new york. 2 1/2 days per sign - i can see the 3rd house cusp reaching the 9th house cusp where uranus is situated in 15 days, which would translate as 6 signs and coincide with the events for june 30th... do i have this all correct according to your system? i don't get the uranus / eris / ceres/ combo in the 12th of the lunar return though..
let me know your thoughts.. thanks! ps - for others reading this.. let me know if the screen shots of the charts is too big.. i have decided to try a larger picture format as some of the charts i have posted are too small to read the fine print - like the last one i posted focusing on midpoints..
James. 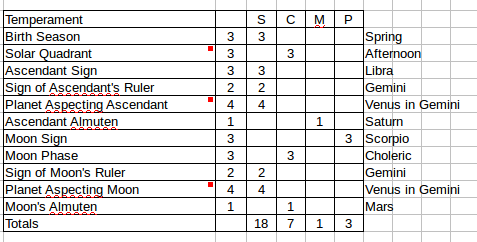 Above is the lunar return chart I used from Janus which seems to be different to yours and I don't know why. I'm sorry I'm feeling very unwell today so I cannot think straight and unfortunately I am unable to comment further on this thread. I can just say that I direct the Moon to the relevant date (or thereabouts) by counting 12 degrees per day (thus 2 1/2 days per 30 degrees). I do this with solar returns also. I have been using symbolic directions ever since reading Charles Carter's book on the subject. I can just say that I direct the Moon to the relevant date (or thereabouts) by counting 12 degrees per day (thus 2 1/2 days per 30 degrees). I do this with solar returns also. I have been using symbolic directions ever since reading Charles Carter's book on the subject. Very interesting indeed. You do wonder why there isn't software that will do this for us? Its seems such a logical, natural approach. I must re-read that book by Carter. I think Carter was a very good astrologer. We tend to think of solar arcs as a newish technique but he and Vivian Robson were advocating this approach in the 1920's and 30s. They called it the 'radix technique'. Looking even further back I think this method of progressing the solar return was used by some Perso-Arabic astrologers. I recall Benjamin Dykes demonstrating this method a few years ago at a workshop. thanks for sharing this and i am sorry you are not feeling well..
the lunar return is a return of the moon to the place it was in the natal chart.. i have a moon at 0 scorpio for boris.. this is the reason our charts are different! as mark points out the idea of directions has been around for a very long time, although discussing directing lunar returns is not something discussed much at all! i am not sure of the order here, but while carter was talking about this, ebertin used them extensively too as did the earlier german astrolgers.. carter and ebertin were contemporaries of one another - 14 years apart in terms of age. and as mark points out - the use of directions goes way back - the idea of primary directions being a more complicated version of a version i have also seen discussing the idea of 1 degree per year which is what solar arc directions essentially are. i like this idea of directing a lunar return 2 1/2 days a sign! i don't know that it is very popular, but it would be fun to try it out and perhaps some folks are hiding in the woodwork who use it regularly, but they just haven't come out and told us! The chart is a nice size, but the text way over on the left makes the size too wide. The standard Message Board size is 640x480 which image hosting sites like Tinypic will do automatically. So it must be that Solar Fire puts the text so far on the left of the chart? I wonder if there's a way to change that. It must have to do with a wide monitor size? Text is a lot more clear black on white than white on black--easier to read. I often print pages from Skyscript to keep for my files. But any page with a black background for a chart can't be printed. Who wants an entire page of black toner or ink? Some web sites have dark backgrounds. I can't even read them. I have to put the page in Print Preview to read the text. Hi - here is Johnson's chart presented in the traditional manner. First up, his is a sanguine temperament. This gives him convivial, easy-going appeal and the boyish enthusiasm for life. Of course, in the matter of a serious national crisis, this is not necessarily going to stand him in good stead! I use a personally devised method of calculating temperament shown in the table below. For the planet aspecting ascendant I have used the ruler Venus (counted as hot and wet as so close to the Sun) as there is no traditional planet closely aspecting (within moiety) the rising degree. In my view, the almutem figuris (Lord of the Figure) is Mercury, although some methods will give Saturn. I prefer Mercury as it is in its own domicile, elevated in the ninth house, and quick and direct. It is also in hayz. Saturn, by contrast, is below the horizon, retrograde and very slow. Using the five degree rule whereby a planet within this proximity to a house cusp is considered to be in the following house, it is just in the difficult sixth by Alcabitius. Johnson is clearly extremely bright, in the intellectual sense, which fits with Mercury having this power in his horoscope. However, in his case it is the trickster/fool quality of Mercury that plays out. This too, in my view, finally undermined his charge to be PM, because he could not carry the day within any gravitas. This is, incidentally, another reason why I do not prefer Saturn as the almutem figuris. He would surely have been a much more sober figure in political life if he had the greater malefic as the overall chart ruler. You have made this point before Therese. And I think James has explained his differing view. I understand your preference and for what it is worth I tend to agree charts are easier to read with a light background. But as I see it this is a matter of personal taste. I recall my predecessor on the mundane forum Andrew Bevan put up charts in this black background manner for years. If people choose to put up charts in this colour background that is their prerogative. Its generous of any poster to take the time to display a chart in the first place. Lets keep that in mind. System preferences->Keyboards->Shortcuts ->Accessibility->tick invert colours. Then when you use Cmd+Cntr+option+8 together - it will invert colours and make it easier to read and then switch back. there should be a similar trick with windows somewhere. I wrote my post only because James asked for feedback on size. I am using older equipment, so didn't know about size options. There have been a lot of changes since wide screens were introduced for computers. Older XP notebooks still have the square screen, so any graphic beyond the standard 640x480 causes text to run off the screen. I use this XP system because ADB version 4 (now with more than 50,000 births), JigSaw and Solar Fire all work flawlessly together for research. Data can be moved between the programs. Am I using a dated system? Of course, because ADB is the basis of most of my astrological work now. thanks therese for your feedback and to mark and panky for giving a helpful response to therese as well. personally i find looking at white screens discouraging.. the world and internet are swamped with them! 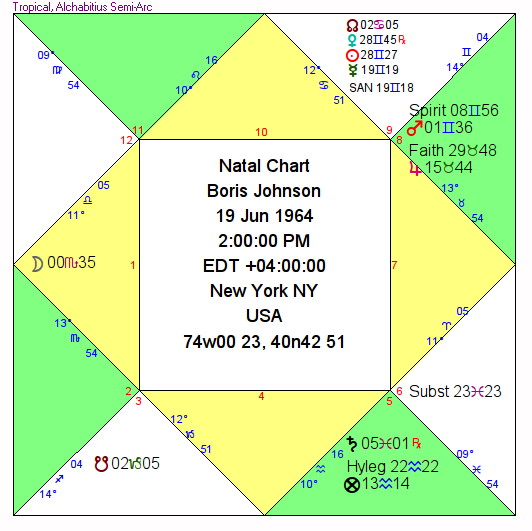 but i know every system has limitations..
boris johnsons chart is an interesting one for me as it presents the dilemma of whether one will work with a natal or a relocated chart.. when doing the uk vote on europe/brexit i worked with the natal and relocated chart for boris..i also highlighted the relocated 2016 solar return with 23 aries focus which we previously discussed.. here is his chart relocated to london..
the chart relocated to london seems like a mixed bag of goods to me.. having the saturn and mars square on the angle is only slightly offset having sun/venus square the midheaven! actually i am decidedly negative on this relocated chart upon further inspection.. perhaps the merits of his natal chart with the positions they have have offset this to a degree, but it wouldn't be a chart i would suggest the person goes towards! thank god i am not his astrologer, lol..
the solar return relocated to london - seen below is a noticeably better and perhaps offsets some of the angst i feel looking at the relocated chart above, if only for this year.. being an outsider living in canada, it is hard for me to follow the flow of info and personalities that are a part of the uk political scene. i would probably be well advised to pick a different topic, or colour given all of these dynamics at work! but it is fun to examine them anyway. that line up in the natal relo chart to london which also includes uranus aspecting the ascendant certainly seems to shine thru in the hair style of his anyway..
i am unable to get rid of the text on the left side with the data.. it is a built in feature of solar fire that i don't believe there is an option for getting rid of it.. i might be able to place the info in a different location on the chart, but i like the simplicity of this chart.. i am going to display a different colour option here just for you though.. tell me what you think if you are unable to apply panky's set of tools for resolving this issue.. Thanks for your reply, James. I think black is the best option other than the usual chart on a white background. I can read the chart just fine--it's attractive. It's the printing that would be the problem. I thought in the newer versions of Solar Fire, the data could go in the center of the wheel?? I see this often in articles where Solar Fire was used to calculate the charts. That option isn't available in my version 5.1. But then Mark had a way of putting the side text closer to the wheel. Sometimes I wish we were back to using DOS where there was only one option, take it or leave it! Wide screens are here to stay. Not much I can do about it except buy a new computer to use only for the Internet. My version of Solar Fire won't even run on newer operating systems, but I like the simplicity and speed of the earlier version. Anyhow, I'm sorry about distracting this topic from the main focus on Boris Johnson. it might have to do with the picture that it captures off my screen? i am confused by why it is the way it is.. i have a wide screen - 28 inches or so.. i have the option on the upload chart set for 15 inch monitor... i know about this feature of putting the data in the center of the chart, but can't remember how to get that.. i''ll look into it. I agree with you astralwanderer and thank you for your assessment of Boris Johnson being of sanguine temperament. I also think that Mercury is his planet because on the dispositor chain everything goes back to Mercury. The Sun / Venus conj. is close to Betelgeuse in Orion. This is the star of the military leader so it could easily apply to politicians and sportsmen. Orion is the hunter. We have masculine energy here. Bo Jo did not become London mayor twice without being a successful fighter and campaigner. At the same time as the Orion energy we have stars in Lepus close to three of his planets. Eta Lepus is at 28 Gemini 35 midway between his Sun Venus conj. HR2065 Lepus is also at 28 Gemini25. So the Lepus constellation is significant here. The hare was known in some cultures as a �trickster� (The word astralwanderer used). Beta Lepus being at 19 Gemini 10 within 10 minutes of his Mercury seems to confirm this to me. No star is wholly bad or good and Lepus can have a positive influence of speed of movement and thought but it also seems to yield its fair share of rather untrustworthy characters, particularly in regard to fidelity. BJ is known for his marital infidelity. The hare was regarded as an animal sacred to Aphrodite and Eros because of its high libido. To be fair to BJ his Lord 7 Mars is not conjoining a Lepus star (so far as I can tell) but it is in a 1 min orb to Mirfak alpha Perseus which is on the right side of Perseus � a masculine image � power over women I think. Noonan also describes the constellation of Perseus as denoting adventurous individuals who are also less than honest in their dealings with others. Regarding his recent downfall the star Rigel although 3 degrees from his natal Mercury is much closer to his Basis part/lot. Also Mercury was rising before the Sun on the Poll opening chart and was conjoining Rigel. Ebertin describes the effects of this star as sometimes indicating a fall from success and a failure to reach set targets. Hi there - thanks for your comments Vicki. As the final dispositor of the chart Mercury gets added emphasis. Another cue that Mercury is so important in Johnson's chart is that the degree of the PNM (pre-natal new moon) is occupied by Mercury in the nativity. The PNM was also an eclipse further charging this degree with power. Does this suggest that Mercury is both Johnson's greatest gift, but also his undoing? Pars Hyleg, the degree in the chart that has the same angular relationship to the ascendant (measured in the direction of the signs) as the pre-natal lunation has to the degree of the natal Moon, is at 22 AQ 22 in the fifth house. I am just beginning to work with this part, due to re-reading Zoller's Arabic Parts book. Bonatti describes this part very cryptically. However, it essentially represents the distance travelled by the Moon to its natal position since the pre-natal lunation, projected from the degree of the ascendant. That this part is in the fifth house suggests that he takes pleasure in pleasure itself, although its almuten is the rather difficult Saturn in Pisces near the cadent sixth. This draws attention to the tension between Saturn and Mars in his chart. The greater and lesser malefics aspect each other with slow, retrograde Saturn facing the approach of Mars. Both malefics have dominion in the first house, the greater being the almuten of the ascendant and the lesser being the almuten of the Moon and the co-ruler of the first house. Mars sits in the eighth house, so both malefics occupy challenging houses neither of which aspect the ascendant. With this we might begin to see that Johnson's charm might mask a much tougher, darker side to his psyche. You are right - nobody wins a mayoral election in London without being prepared to scrap.